Rooftop and whisky bars an indoor pool and spa services seal the deal at the non-smoking Watergate Hotel. Private balconies flat-panel TVs mini-fridges coffeemakers and marble bathrooms with top toiletries are furnished in all 336 non-smoking stylish rooms at the 15-story Watergate Hotel. Free Wi-Fi is provided throughout the hotel's public areas and is available for a fee in rooms. For panoramic views and refreshing cocktails head to the rooftop bar or opt for the whisky bar off the lobby. The hotel has a restaurant as well as 24-hour in-room dining. After heating up in the fitness center cool down in the heated indoor pool or book a session in the in-house spa. The hotel also provides a business center and a gift shop. Pets are allowed and parking is available for an extra charge. Off I-66 and the Potomac River the Watergate Hotel lies within a 10-minute walk of the John F. Kennedy Center for the Performing Arts. Washington D.C. offers a range of popular sites including the U.S. Capitol three miles east and the White House within two miles. 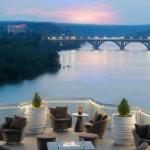 Guests are also less than two miles from Arlington National Cemetery and downtown Georgetown. Ronald Reagan National Airport is within five miles.